100% pure, crystal-white, natural desert salt. Just as it existed when traded ounce for ounce for gold eight thousand years ago. We add nothing and we take nothing away. As nature intended – no additives, no anti-clumping agents, no preservatives. Dried by the hot African desert sun. Unrefined and unprocessed. The underground brine lake is 100% saturated, so it takes only 4 weeks for the salt to crystalise in our main harvest season in summer when the temperatures reach up to 47o. The ancient Dwyka rock formations, through which the underground streams flow, are geo-scientifically tested to be 250-300 million years old. The 50km2 salt pan is situated in the Kalahari Desert of 900,000km2, inside the Kalahari Basin which spans an area of 2.5 million km². 50km’s south of Botswana and +-250km north of Upington. A remote, pristine and beautiful area. The name KALAHARI is derived from the Tswana word Kgalagadi, meaning ‘the great thirst’. Oryx Desert Salt has all the essential minerals and trace elements that exist naturally in salt, including magnesium, zinc and potassium. It provides your body with the correct balance of these minerals, as nature intended, so they can be utilised and absorbed for optimal vitality and health. 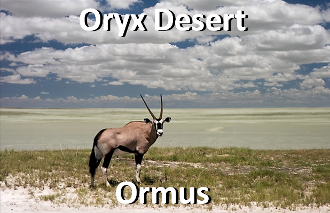 Oryx Desert Salt has a unique and exceptional taste, which enhances and enriches the flavour of your food. Chefs from around the world taste the difference. “ORYX salt is a great food salt. I use it as a salt on a day to day basis, as well as a finishing salt. The salt is everything I look for when it comes to flavour.” – Craig Cormack, Sofia’s at Morgenster Estate, Somerset West. Locally collected Ormus minerals made with gourmet Dead Sea Salt, Oryx Desert salt, and harmonically structured water.